With the World Cup group stage well under way, many people are already looking at how things will shape up in the knock-out round. Here we give you a one-stop guide to some of the issues that have stumped many fans about the way the tournament is being run. DO BOOKINGS AND SUSPENSIONS APPLY IN ROUND TWO? Single bookings from the group stage will not be carried over into the knock-out stage, but any suspensions incurred must be served. Peter Crouch and Steven Gerrard were both booked in England's opening 1-0 win over Paraguay, while Frank Lampard was shown a yellow card in the second match against Trinidad and Tobago. If the trio avoid picking up cards in the final match against Sweden, those cautions would be wiped out. The position over the length of bans for sendings-off is not so cut and dried. "In that case, the length is decided by Fifa on a case-by-case basis," Football Association spokesman Andrin Cooper told BBC Sport. WHAT SPECIAL INSTRUCTIONS HAVE REFEREES BEEN GIVEN? At a meeting in March, football's ultimate law-making body the International Football Association Board gave referees an eight-point plan to try and stamp out specific targets. They are elbowing, reckless tackles, shirt-pulling, time-wasting, diving, encroachment, players wearing jewellery and the attitude towards officials. 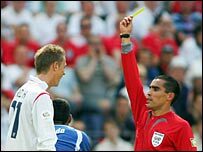 Although the new rules have not led to an early rash of red cards, in the opening games players have been booked for rarely-penalised offences like the goalkeeper holding on to the ball for too long, and for appealing for an opponent to be booked. All the officials on the World Cup list have had regular meetings in the run-up to the tournament to ensure consistency of application. WHAT IF TWO TEAMS FINISH LEVEL IN THE GROUP STAGE? If two or more teams finish level on points at the end of the first round stage, a series of criteria determines their finishing order in the group table. The first is who has the superior goal difference over the group games. Should the teams still be level, whichever team has scored the highest number of goals will advance, or if that fails, it will come down to which team took most points when they played each other. As a final resort, if none of these factors can separate the teams, the World Cup organising committee will draw lots. WHAT ABOUT SUDDEN DEATH MATCHES? The golden and silver goal rules will not apply at any game in the tournament. Any game in the knock-out stages which finishes level after 90 minutes will then be decided by a full 30 minutes of extra time, or a penalty shoot-out if necessary. Any player that is not named in the starting XI automatically starts on the bench but only three substitutions can be made throughout the course of the game. The first time the rest of the squad were available on the bench was in France 1998. This was also the year when the squad list was expanded to 23 players. The dugouts in grounds have been widened to allow the accommodation of the remaining players. Before the tournament, Fifa said that when possible, it was keen to award any disputed goals, like England's against Paraguay, to an attacking player. A Technical Study Group will sit and judge when there is any dispute over who scored. 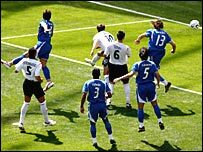 In the case of England's goal, the group decided that the goal should go down as an own goal by Carlos Gamarra, who deflected the ball in, rather than be given to David Beckham, who supplied the free-kick. WILL THE TROPHY EVER BE HANDED OVER PERMANENTLY? In 1970 Brazil's third victory entitled them to claim the Jules Rimet Trophy permanently, and a new trophy, the World Cup Trophy, was contested at the next tournament, four years later in West Germany. The World Cup Trophy will not be retired until the name plaque has been filled with the names of the winners, and is expected to remain in use until 2038. As well as winning the original trophy three times, Brazil have won the World Cup Trophy twice. Italy won the original Cup twice and the new Trophy once, in 1982. Germany/West Germany have won the tournament three times, twice lifting the current Trophy, and Argentina have also won the current Trophy twice. But even if they win it again, no-one will receive this Trophy outright. This year's winner will receive a replica of the World Cup Trophy regardless of how many times they have won it.